Pest description and damage The adult holly bud moth is a mottled brown and black insect with a wingspan of approximately 0.5 inch. 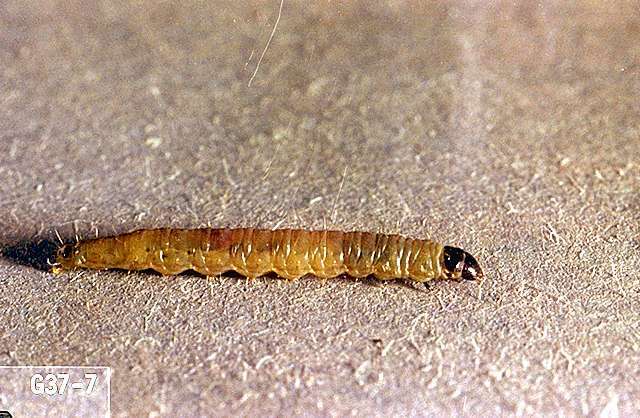 The larvae are greenish-brown with dark heads and about 0.5 inch long. The larvae roll and web leaves resulting in distorted leaf tip growth. Another name for the holly bud moth is blackheaded fireworm which also feeds on cranberry, blueberry, apple, and cherry. Biology and life history Overwintering eggs hatch in the spring. The larvae begin feeding on buds but soon move to leaves, which they roll and hold in place with webbing. Mature larvae drop from the plant and pupate in the duff. The second-generation females lay eggs singly on the underside of leaves, and larvae from these eggs emerge by the end of July. There are two generations per year. Pest monitoring Thresholds for ornamental trees differ from those in commercial holly orchards and nursery settings. In landscape settings, damage is often kept to a minimum by natural enemies and leaf distortion is hardly noticed. 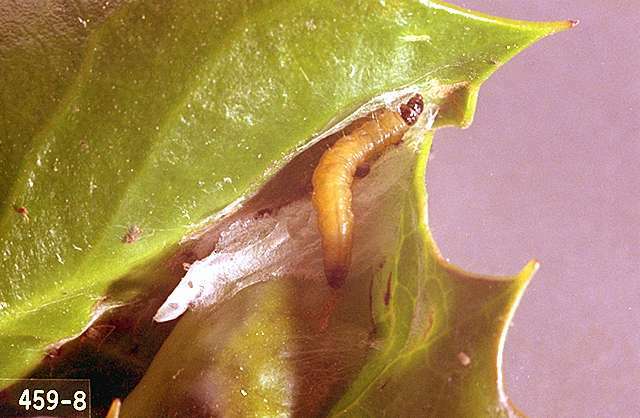 Watch for the first sign of new growth, when holly budmoth larvae start tying leaves together. Hand pick larvae when they are found in rolled leaves. 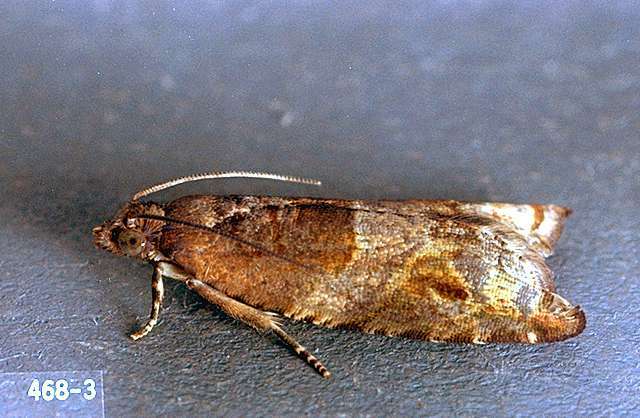 When the budmoths are well established and before they pupate, shear trees and hedges to remove the larvae and infested tips. Collect and destroy the debris. Little is known about natural enemies, but the low number of infested leaves in most years suggests they exist. Do not spray holly in bloom. Apply listed insecticides (see: "Caterpillar" in Common Landscape Pests) when new growth is about 0.25 inch long and before blossoms open.